MidAmerica Basement Systems provides quality basement finishing and remodeling services in Eastern IL and Western IA. Serving Peoria, Cedar Rapids, Davenport and surrounding areas. Bix Basement Systems is a basement finishing company that services areas throughout Iowa, Illinois, and Missouri. They offer basement finishing services such as waterproofing, a full line of basement remodeling products and uniquely designed flooring, ceiling tiles, and wall panels. Our basement finishers provide high-quality products including basement walls, basement floors, basement windows and energy-efficient dehumidifiers to make your basement feel as comfortable as every other room in your house. We also offer basement ceiling tiles and Egress window wells to bring more sunshine into your basement. Our Total Basement Finishing system will make your basement feel warmer, drier and cleaner than ever before! Our work comes with a 50-year mold-and-moisture warranty. We have had you do several projects on our house, we trust you. Very low pressure - that's most important to us. And when we wanted to adjust the work being done, we were listened to and our wishes were honored. Consistently polite, friendly and professional. I was comfortable with them in my home. They treated our house with respect. We could barely tell they had been there! We liked the fact that one company provided a variety of products and could do the job in a relatively short period of time. Our overall experience was great. Every step of the process was well organized and went as planned. The results were outstanding. We really appreciated how detailed and personalized the service was. The sales presentation information was clear and easy to understand. The guys on our installation crew were awesome! They were professional and polite and very efficient. They provided updates on their process and the quality of work was great. Everything was a first-rate job. We really appreciated how careful the crew was during the cleanup. They went the extra mile in every way. The only way you could tell they had been here was the fact that our basement looks 100 times better than before! We chose MidAmerica Basement Systems because of the clear information that was presented in the initial meetings. Basement finishing is a great way to add usable space to your central Iowa home and add value to your house once it comes time to sell. Our basement finishing contractors in Iowa are highly trained and can provide you with a free basement inspection and estimate. 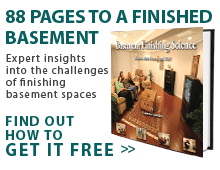 Our basement finishing contractors are a part of the Total Basement Finishing network. This network is comprised of trustworthy and trained professional contractors located all over the country, including right here in Iowa! Give us a call or contact us online today for your free basement finishing quote and let us help make your basement beautiful! Whether you live in Fort Dodge, Ames, Marshalltown, or the greater Des Moines area, we have a local basement finishing contractor that can help you. We would like to have about 980 square feet finished in our basement including a bedroom, bathroom, and rec room. We were curious what unfinished thermalDry flooring costs. Also possibly looking to get a basement room finished. Thanks! Comment: We would like to have about 980 square feet finished in our basement including a bedroom, bathroom, and rec room. Comment: We were curious what unfinished thermalDry flooring costs. Also possibly looking to get a basement room finished. Thanks! Another Great Review on FaceBook! It's been a great year! Check out our 2015 accomplishments!